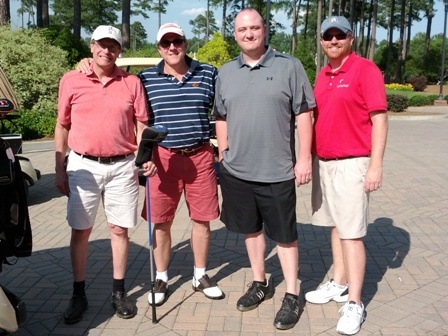 OTB Consulting (developers of BKexpress), The Law Offices of John T. Orcutt (one of OTB’s largest BKexpress users) and LexisNexis teamed up for a round of golf at the Cary Chamber of Commerce Annual Golf Tournament at Prestonwood Country Club. Great fun was had by all … but, no worries about them leaving their day jobs for professional golfing careers! Pictured left to right: John Orcutt, OTB Consulting/BKexpress client | Tom Rowe, Sr. Managing Director – OTB Consulting, Chief Architect of BKexpress | Rick Coeburn, Practice Mgmt Specialist – LexisNexis | Tom Roeder, Mrg Practice Mgmt Sales – Lexis Nexis.